Former Lakers muse about the Mamba in Sports Illustrated, the Washington Post and The Players' Tribune. Lakers great Magic Johnson posted a letter to Kobe on his official website. 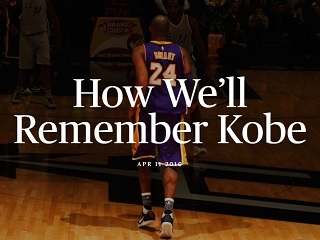 On The Players’ Tribune, where Kobe announced around Thanksgiving his decision to retire at the end of this NBA season, the quartet of Horace Grant, Brian Shaw, Ron Harper and Devean George take turns sharing memories under a combined Retired / Los Angeles Lakers byline. But that was the power of Kobe. Forget playing with you; just working out with you was crazy. It tested my will, because you were a creature similar to some of the best players I’ve played with: D-Wade, Gilbert, Dirk, Kevin Durant, Chris Paul, guys who worked on their craft relentlessly. I wasn’t going to ever quit on a workout, especially with you, but it just made me think, “This is what it takes. All this stuff didn’t happen by coincidence. That’s why he’s so successful. And if I want to be successful, that’s what I’ve got to do, and that’s the work I’ve got to put in.” That opened my eyes. There are so many games in the NBA, it’s easy to start going through the motions. He kept everybody on edge. In practice he challenged people. He talked trash to people. It wasn’t for everybody. Some players can’t deal with that, but I didn’t mind. It was his way of motivating you and pushing you to give more. It’s easy to get comfortable. He made sure nobody was comfortable.